You agree to a EULA every time you install new software. But since EULA's contain lengthy and boring text in small fonts, most people skip reading them altogether. That's a risky option because if you aren't reading the license agreements, you have no idea what you could be agreeing to. Well, there is an easy way to read and analyze license agreements. EULAlyzer helps you understand just what you're agreeing to and flags clauses that deserve special attention. 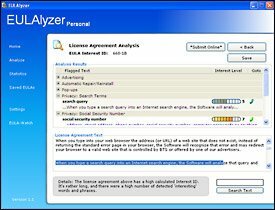 EULAlyzer Personal analyzes language of end user license agreements (EULAs) and flags "interesting" phrases. You can optionally save analyzed EULAs or submit them to Javacool's security center. Be sure to use EULAlyzer during the installation process though, as EULAs (especially shady EULAs) aren't generally accessible after install. When installing software, never just click past the license agreement. Pop it into EULAlyzer, and EULAlyze it!